A delegation of bewildered visitors being shown over The Works, circa 1972. The wet concentrating circuit is under the roof; the plastic-lined tailings dam is hidden by the roof. Proof that in mining, too, from little things big things can grow is the Molyhil tungsten mine 220 km north-east of Alice Springs. Mr Johannsen was working with his late father, Kurt, the legendary inventor of the road train, bush pilot and prospector. Cut to today: Thor Mining announced in its June 2016 quarterly stock market report “discussions with a view to securing project development finance” are under way. “The project development cost for Molyhil is estimated at $64m. Several entities are currently reviewing the project. A continued recovery in international tungsten prices should assist with project financing. This is how Mr Johannsen tells the story. Molyhil’s tungsten occurs as calcium tungstate (scheelite), a dense, softish, pale coloured mineral which fluoresces brightly in the presence of ultra violet light – rarely blue, mostly white and sometimes a creamish colour, depending on the molybdenum content in solid solution. After acquiring tenure we constructed a milling and concentrating plant capable of treating one and a half tons of ore per hour. In it we used various items of second hand mining machinery Kurt had collected over the years – plus some fifth hand corrugated iron, bush timber and an inordinate amount of fencing wire (see photo). During this period we hand mined ore from exploratory trenches behind the photographer. At the same we constantly modified the mill and made the gravity concentrating circuit more efficient. Subsequent to this I identified a much larger orebody, under a low rise about half a kilometre to the east (in the treeline on the left hand side of the photo). This non-outcropping deposit proved considerably richer and its deeply weathered ore was amenable to bulk open cut mining. As a result the mill and concentrating circuit were upgraded to about two and a half tons per hour. Then, in 1976, China experienced the devastating Tangshan earthquake. Prior to this Chinese production had dominated the market, to such a degree that they essentially controlled it. The earthquake knocked out much of this production and, rather than selling from their extensive stockpiles, they let the production shortfall boost the price. In fact, during early 1978, a five tonne consignment of plus 80% WO3 concentrate was sold by us, six by two hundred litre drums full, fetching almost $12,000 per tonne – in 1978 dollars. 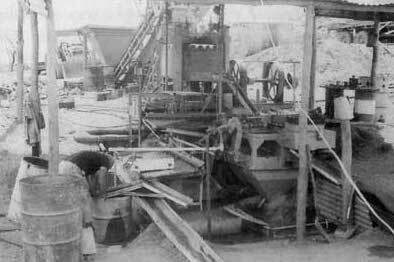 Later that year the Molyhil Mine operation was sold to Petrocarb NL. They made extensive changes and additions to the mill and gravity concentrating circuit, which lifted ore throughput to five tonnes per hour. A couple of years later Petrocarb was taken over by Nicron. At about the same time primary ore was beginning to be encountered in the mine. This contained what were sub economic amounts of molybdenum sulphide (molybdenite) which, in the close-to-surface ores, had weathered to powdery non-recoverable oxides. As a result Nicron installed a molybdenite flotation circuit to capture what was a helpful accessory mineral. But mined products – like all commodities – are slave to supply and demand, and the high tungsten prices of the late 1970s had miners, world-wide, searching for fresh deposits. New mines were opened and existing mines lifted production. And when Chinese production began to come back on line the tungsten price headed due south. Before long Molyhil Mine became uneconomic and was closed – along with many operations worldwide. Notable amongst these was Australia’s King Island Mine, in Bass Strait, which had become a major supplier on the world market. Thirty years have passed since that time and much has changed – new Northern Territory Mining Acts, the advent of computers, improved mining and metallurgical techniques, better exploration tools and mining machinery. And while the Molyhil orebodies are not world beaters in the global sense, the main deposit comprises a very nice, compact, clearly delineated and easily quality controlled and mined rock suite. The ore from there is easily crushed and milled, has a low abrasive factor, and its economic minerals are liberated cleanly and with little pulverisation loss. Further, the scheelite is readily recovered using simple wet gravity techniques and the molybdenite comes away via the simplest of flotation processes. Additional exploration in the area is essential, of course. Successful exploration can mean greater ore reserves and greater ore reserves allow economies of scale. But, ultimately, as with any venture, the business of a mining project’s development or lack thereof depends entirely on the sums, both on the day and into the future.